Halifax in 1993 was a great place for music---according to critics all over North America---especially if you wore flannel. But outside of "the whole grunge thing," as Derrick Hiltz calls it, the city's small punk scene operated independently and produced the now-legendary Chitz. 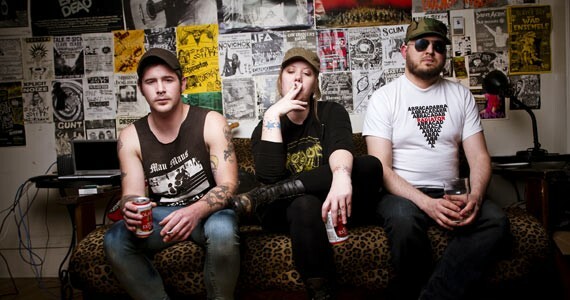 The band formed from friends who'd played in other punk bands, when Hiltz and Mike Brygyder linked up with guitarist Richard Lafortune, who suggested Cara MacDonald as a vocalist. "Richard and Mike approached me at a show, which I was really hammered at, and asked me to sing. I of course agreed because I was really drunk," MacDonald summarizes. Brygyder later left the band, to be replaced by Ian Hart, who now lives in Toronto but is coming to town for the reunion show. The band was active from 1993 to 1998, mostly in the city's all-ages community, and left its mark through shows and a five-album discography. "We played probably 80 percent of our shows" at Cafe Ole, the defunct-but-not-forgotten Barrington Street all-ages venue, says Hiltz. "It was a good little scene...we played with all of the punk rock bands that were here at the time." They played only three bar shows in five years. "We figured people who were old enough to go to bars wouldn't care about [the sort of music we played] at all, even though we ourselves were old enough to go to bars," Hiltz says. "We made a lot of friends who were younger and some of those friendships have lasted to this day." "It was just really varied," says MacDonald. "It wouldn't be unusual to see an 11- or 12-year-old, and some of those 11- and 12-year-olds are still active in the music scene today." While the grunge scene thrived, the punk scene was "totally separate in every way," says Hiltz. "None of [the local punk bands] got any press at all, or any hype at all. It was completely ignored in the face of that other music scene that was much bigger. "We never played with bands from that scene, we never interacted with bands from that scene, and it's not because we avoided it, you'd just never run into people from that world," he continues. The worlds got a little closer in 1996 when the Chitz were asked to play the Pop Explosion, then called Halifax On Music. "It was very surprising to us, we just assumed that nobody would want us to play there because we were a punk band, not an indie rock band," he says. They never felt left out, though. "I didn't feel excluded from it because it wasn't our world," Hiltz says. One of their songs, "Next Big Thing," mentions Sub Pop Records and the Halifax-is-the-next-Seattle phenomenon. "It's very dated-sounding now," says Hiltz. "We just thought it was kind of weird that all of a sudden there was all this attention being paid to Halifax by the press." The band played around the Maritimes, but only toured outside the region twice. They reminisce about the city's all-ages scene in the days before the internet, when exposure to new music meant tuning in to CKDU in a parent's car, and bands received handwritten letters telling them to play other cities, requests that mostly went unfulfilled. But they have no regrets. "We left our mark as far as the music we recorded," MacDonald says. "We made a lot of friends, had a lot of fun."